Young people. Where does their energy to pursue their passions come from? What will they do to realize their crazy, diverse ambitions, which can be from air guitar championships to breakdancing? 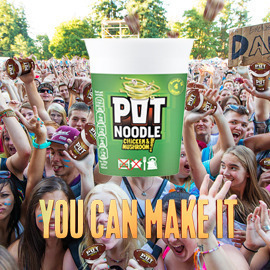 Pot Noodle recognizes these diverse dreams and is there to help make it happen. Show crazy ambitious young people that Pot Noodle is THE snack to empower them to pursue their own dreams, no matter what those dreams may be. Format: Presentation with text and visuals (maximum 5 pages PDF). We are lookig forward to your creative ideas, you can submit them till July 08, 2015 23:59 UTC!